Posted Oct 31, 2018 | filed under Weekly Banding Reports. It is the end of October and with that comes the end of our owl migration monitoring season. Despite a very slow start to the season, it ended up being the second busiest owl season ever. Meaning we achieved the second busiest fall for both songbird banding and owl banding – not too shabby and I have to say I appreciate the parallelism. 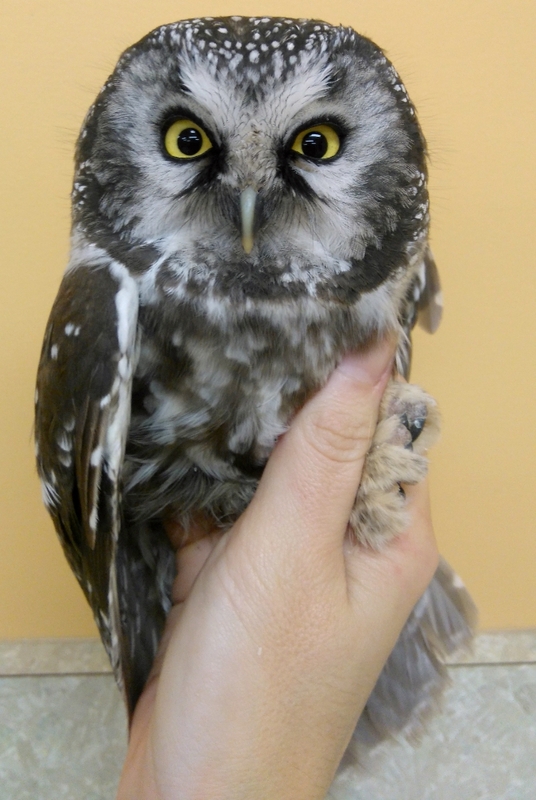 We ended up banding 186 northern saw-whet owls (the record is 200) and three boreal owls. In addition to that we recaptured a barred owl that was banded way back in 2009 and a saw-whet that was banded in 2015. 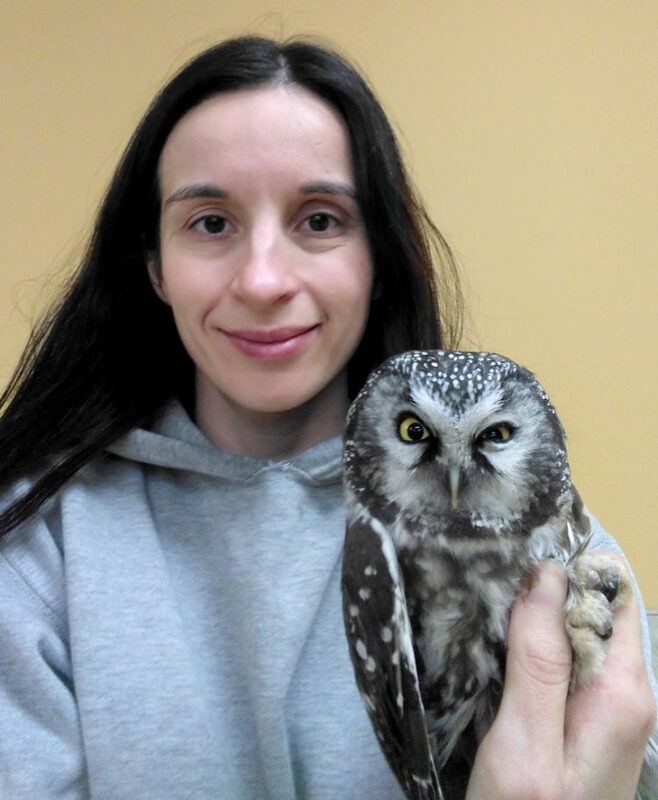 This year was the third year of a trial to monitor boreal owls. Not a lot is actually known about boreal owls as they are small, secretive and live only in the boreal forest as their name suggests. Boreal owl and the last bird banded during the 2018 monitoring season. Thanks to breeding owl surveys we have always known that they breed in good numbers in the Lesser Slave region, but we wanted to try and learn more about their movement patterns and see if there was any sort of migratory trend. The first year we caught seven boreals, last year we caught none and this year we caught three. Not looking like much of a trend as of yet… Could be that boreal owls are not as migratory as believed. And an owl species being migratory is pretty important when it comes to catching them for the purpose of determining population trends. We do not use any sort of lure during songbird banding because we are trying to get an unbiased sample of the birds moving through the area. For owls we are targeting specific species so we use an audio lure to call them towards the nets. If we were to try and monitor non-migratory owl species we would have a very small pool of individuals to try and attract – just the ones who live within earshot of the nets. Then, once attracted and banded, it is unlikely those owls will fall for the lure again within the same season. With migratory owl species new individuals are moving into the area every night and so we can get a broader picture of the population trends as opposed to just counting how many are in the immediate area (which, time will tell, could be what we are doing with the boreals). This year the end of the season also means the end of my time here. I have been with the LSLBO for the past ten years but, as you may have seen in a previous issue of this newspaper, Richard and I are moving on. The LSLBO will always hold the dearest place in my heart. It was my first real job after graduating from post-secondary and it was where I met my husband. I can only hope that I will find another job as rewarding as this one has been. My being done at the Bird Observatory also means this will be my last article. I want to say thank you to all my loyal readers. I enjoyed writing these articles and I can truly say I will miss it (maybe as much as you will miss reading them? I can only hope). With that, for the last time, I want to wish you all a good winter and good birding! Me and my last bird. 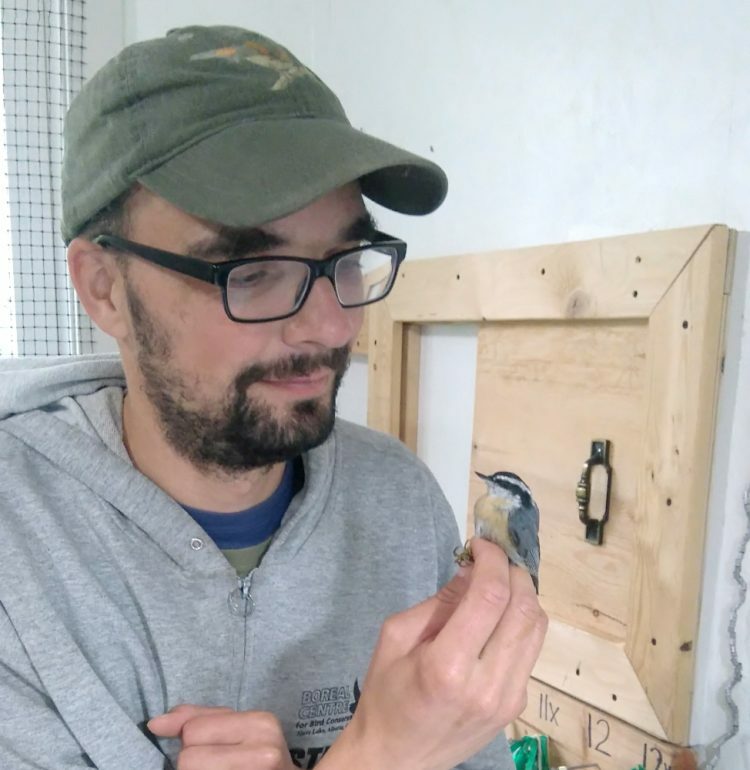 Richard and one of his last birds, and his favourite species – a red-breasted nuthatch. Spring is just around the corner, so join us for our upcoming "Bird Songs of the Boreal Forest" webinar on THURSDAY, APRIL 18th, for a fun and informative introduction to the amazing world of bird songs. Birding in the boreal forest can be a challenge. You can hear them, but you just cannot see them to identify them! Spend an evening with the staff of the Lesser Slave Lake Bird Observatory and learn how to identify some of the common and distinctive songs that can be heard in the boreal forest plus how and why birds sing, what is a call versus a song, and more. Afterwards, you will be amazed at what you will “see” on your next walk in the woods. This interactive webinar is geared for novice/recreational birders and nature lovers of all ages. This webinar is free, but you must register in advance to participate. We hope to see you there! Boreal Centre for Bird Conservation shared a post. Good guesses everyone! The wingspan for this bird's wing imprint was actually quite small - only about 20 cm. We didn't see who made it but our best guess is that it was one of our resident black-capped chickadees. Aside from scale, what you can't see in this photo is how close the imprints were to the footpath from the parking lot to the Boreal Centre. The Lesser Slave Lake Bird Observatory is a non-profit society committed to avian monitoring, research and education. Your donation is key to our success.